Acknowledging 40 years of preserving Genesee County History which included service at Sloan Museum, Kettering University Archives, Durant Dort Carriage Co National Landmark, Whaley Historical House and of course Genesee County Historical Society and MotorCities Heritage Area. Restored 10 houses. As part of the celebration of our 20th anniversary, MotorCities National Heritage Area continues to salute 20 people who have played a unique role in empowering us over the years: our Champions! 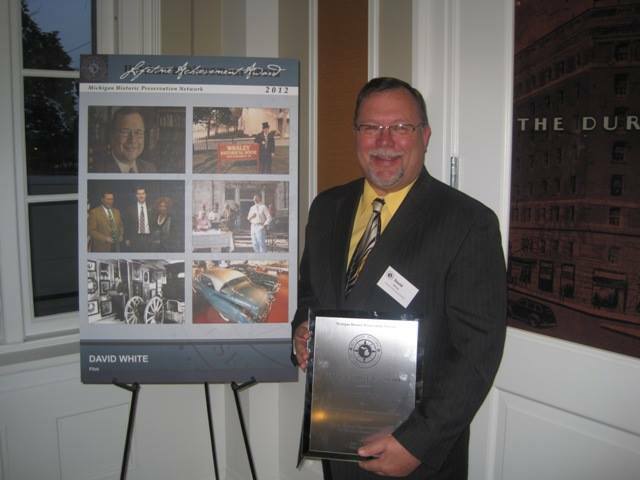 Today, we salute David White. There are many "Motor Cities" in Michigan, but you can be sure that there is only one "Vehicle City" -- Flint. David White is a vocal and active supporter of the history of Flint and Genesee County. The community celebrates automotive giants like Sloan, Kettering, Durant, Buick, Mott and Champion. Since the inception of MotorCities, in his roles at the Sloan Museum and Kettering University Archives, White wanted to assure that the story of Flint would not be overlooked. He led the charge to resurrect the Flint Vehicle City arches on Saginaw Street, returning it to its early 20th Century look. He was also involved in the brick-by-brick restoration of the Durant-Dort Office Building, the birthplace of General Motors and a National Historic Landmark, as well as the creation and installation of 40 wayside exhibits telling Flint's auto story. White also served on the MotorCities Stewardship Council and Board of Directors before retiring in 2017.